Many of us are guilty of wishing we could “fix” loved ones or even casual acquaintances. 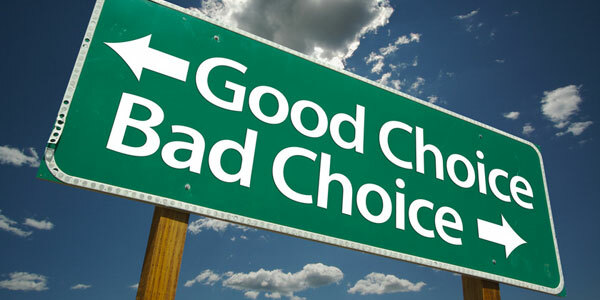 We want them to make good choices that enrich the possibilities for a satisfying life. It’s so darned easy to look from our outside perspective and see the right course! I wish I had a hundred dollars for each hour of my life I’ve spent agonizing over the unhappy decisions someone else has made. I laughed, but I was impressed. Of course, my student was correct. We think we know what someone else should do. Our vision isn’t as emotionally skewed as theirs since we aren’t actually in the same situation. We think we can see the path ahead more clearly. But we’re wrong. We can do no more than suggest alternative options. Then the other person has to make the choice. First, we don’t know what’s best, because we can’t see the future. Sometimes the worst mistakes lead to the most important insights and painful yet essential growth. Everything is good and bad, depending on when you take score. I was delighted when a friend was married to someone who seemed to be a perfect match for him. Then the marriage went horribly wrong, and children were hurt in the process. Life is a roller coaster. So, even if we’re right about what’s obviously best at the moment, we could still be wrong. Second, no two people are identical in anything but physicality. Experience changes the way our genes express themselves (epigenetics), so even identical twins don’t remain identical throughout life. That means when someone who’s especially talented and skilled at empathy–putting herself in the place of someone else–tries to see what another person sees, she, too, isn’t precisely correct. She’s seeing only what she thinks the other person sees. She can’t be the other person. Finally, we’re left with the question of whether anyone can assume responsibility for another adult human being. How can we know what it means for that person to make his or her choices independently? We’ve bumped headlong into the meaning of life. Let’s take a deep breath and celebrate that we don’t have to carry someone else’s burden of choice. How does the cliché go? “It is what it is.” I don’t suppose we’ll stop speculating, though. This entry was posted on March 15, 2014 by Personal Journeys with Gramma in Musings and tagged Bad Choices, Decision-Making, Decisions, Essential Growth, Experiences, featured, Good Choices, Individual Growth, Individuality, Knowing Best, Life, Life's Path, Making Choices, Musings, Path Ahead, Personal Growth, Perspectives, Roller Coaster.